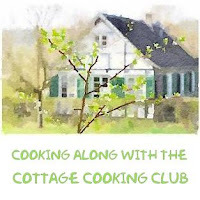 We are now in the seventh month of our year-long food preservation Mastery Challenge hosted by Marisa of the popular canning blog, "Food In Jars". This month we are focusing on hot pack preserving. While I thought I understood the difference between hot and cold pack preserving, it wasn’t until this month that I finally “got” the difference. Basically the more you heat your food the softer it becomes. So while my pickles ended up with great flavor; the texture was a little softer than a store bought one. Still loads of flavor but if you like a more crisp pickle, cold pack preserving is a much better choice. Now for jam making the hot pack method is perfect, it all depends on what you are canning and how you would like the end result to be. This month I made a low sugar blueberry and basil jam and a small batch of bread and butter pickles. 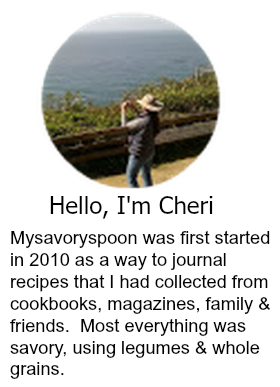 I've learning a LOT about preserving foods and most of it is due to Marisa’s well organized and informative website. Thank you Marisa! For the blueberry basil jam I followed the recipe from the Sure-Jell box except I used the plate test to tell when the jam was done and ready to scoop into jars. For the bread and butter pickles I followed Marisa’s recipe exactly except I omitted the sliced red bell peppers, recipe here. Prepare a canning pot and 6 to 7 half pint jars with lids and bring to a boil, let simmer at least 10 minutes. Prepare cheesecloth by cutting a large square, place basil in the middle and then tie ends together, set aside. Pour the smashed berries into a large wide, non-reactive pot, stir-in lemon juice and add basil packet. Combine ¼ cup sugar from the measured amount and 1 pkg of the Sure Jell in a small bowl, then stir into fruit. Bring mixture to a full rolling boil on high heat, stirring constantly. Then add-in the rest of the sugar, keep stirring. Now this is where I got confused, still unclear. But the directions on the Sure Jell box says to boil one minute longer and then start scooping the jam into jars. Instead I tried the plate test, (see link above). My jam needed more cooking time. When jam passes the test, remove pot from heat, remove basil bag and funnel into prepared jars. Wipe rims, apply lids and rings, and process in a boiling water bath canner for 10 minutes. When time is up, remove jars from canner and set them on a dish towel to cool. You will hear the lids on the jars start to pop soon after. Test the seals by grasping the edges of the lid and lifting the jar. If the lids hold tight, the jars are sealed. If any of the seals are compromised, refrigerate and eat right away. So interesting, this is something I am clueless about! I'm not a canner and only have made freezer jam which my family loves. But I'd love to learn more about the differences. I will definitely check this out. Thanks Cheri! Wow, you made a lot. Love the flavour combination for the jam. Thanks Tandy, it was fun infusing the jam. Cool! I would love to try some of the blueberry basil jam! Thanks Angie, the basil gives the jam a wonderful added flavor, just enough. I've never done any canning. It's one kitchen project I've never tackled. I need to give it a try! One of these days I need can! I say that, a lot, but don't do anything about it. :-( Anyway, this looks wonderful -- and great inspiration for the likes of me. Thanks! Hi John, the more I "can" the more I enjoy it, having fun. I adore bread and butter pickles - and always make my grandmothers recipe :) Also love the idea of blueberry and basil jam - good for you! Looks like you will be well "preserved" this winter! Okay giggling now!!! thanks Tricia! Your jam sounds amazing! You will be set with a pantry full of goodies to get through the winter!! Thanks Liz, I have to carry all these goodies back to AZ with me at the end of the summer. Gosh, mouthwatering. Berries are rather pricey over here, so, its seldom being used, but basil is luscious in my garden. I definitely can get the scent of basil in the jam. Thanks Nava, I really enjoyed this combination. Thanks Natalia! homemade is the best. I have never can anything...but would love to try one of these days...I love the sound of blueberries and basil...thanks for the recipe Cheri! Thanks Juliana, I am still pretty new at canning and I must say the whole process is growing on me, I like it more and more. I love homemade jams and pickles. The blueberry basil jam sounds yummy!! Thanks Dawn!! Have a great weekend! Same here Inger, I think I am becoming more confident in the process, practise makes perfect as my mom used to say. I love that you used a low-sugar recipe for your blueberry jam! So many jams are too sweet these days. I'm on my way to the market now – maybe there will be something good for jam-making! Hope you're having a great weekend, Cheri! Thanks David, love all the summer produce fruits and veggies. Your bread and butter pickles look so good, Cheri! And, of course, who can resist blueberry jam? Trust the basil does introduce an interesting accent. yes the basil worked out nice, though next time I might use a little more, love the flavor. Thanks Grace, can't get enough of the summer produce this year. My Mr adores blueberries! With both blueberries and basil in season this is a fabulous recipe to try! Very interesting! I am not at all familiar with cold pack preserving.